This December, the Central Florida Community Arts Community Choir, Symphony Orchestra, and Dance Company present Let There Be Joy! A Christmas Celebration. 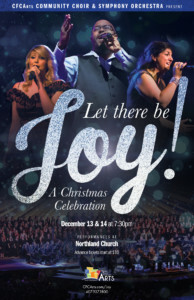 This year, the over 300-voice-strong CFCArts Community Choir takes you on a journey through the classics of the holiday season with favorites like “Frosty the Snowman,” “Rockin’ Around the Christmas Tree” to sacred pieces like “Joy to the World” and “O Come All Ye Faithful” as told through the Christmas story. Find the joy in the season by celebrating this timeless music through the unique and uplifting style of CFCArts Community Choir! All seats are assigned, so you’re encouraged to reserve your seats in advance! Tickets are $10 each for Advance Standard Reserved seating ($15 At-Door), $15 Prime Seating, $25 Premium Seating, and $50 for Premium Plus Seating (Premium Seating, plus a CFCArts Cookbook). For groups of 10 or more, reach out to CFCArts Box Office at (407) 937-1800 ext. 710 for our Group Sales services and group discounts on select tickets. Please note that tickets will NOT be available for walk-up purchase at Northland at any time prior to the night of the show. Tickets may be purchased online or by calling the CFCArts Box Office at 407-937-1800 x 710. Balcony seating is not wheelchair accessible. For accessible seating, please call the CFCArts Box Office. This performance features ASL interpreters. For information and availability for on the best seats to view the ASL interpreters, call or email the CFCArts Box Office. Children ages 3 and under will be admitted for free. For those parents wishing for their 3 and under child to have his/her own seat, a free ticket will be available for reservation. Doors will open at approximately 7 p.m. Nature’s Table Cafe will be open at 5:30 p.m. both evenings – come early and join us for dinner! Ticketing questions? Contact the CFCArts Box Office: (407) 937-1800 ext. 710 or BoxOffice@CFCArts.com. For Groups of 10 or more, contact CFCArts Box Office at 407-937-1800 ext 710.